I was fortunate enough to borrow one of the excellent RCOM King Suro incubators from Interhatch to write a review for a distributor when it first came onto the market at the end of 2009. This gave me an opportunity to put the Suro through its paces for a few months at home. I frequently get asked about this incubator so I thought it was about time I shared some of my experiences and my views on it here with you. The RCOM King Suro is a ‘forced air’ incubator which means there is a fan circulating the warm air inside to provide an even temperature throughout. On the lid, there is a digital read-out to make checking readings or setting the temperature or humidity extremely simple. As you can see from the photos, the lid is shaped in a way that allows very clear observation of your eggs through the side. I found this to be one of the best features of the unit because during the hatch you want to see what is going on and shouldn’t be taking the lid off so that the high humidity is preserved. The automatic humidity control, requires an external pumping module that pumps water from a container (I used a Guinness pint glass as you can see) through a small tube and into the incubator. This tube goes in through the lid and drips inside the incubator very slowly when the pump is running to increase the humidity of the air as required.The King Suro uses an automatic egg turning cradle that looks very similar to some of the Brinsea offerings. 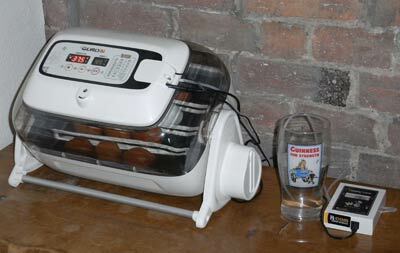 It also has a universal tray much like the Brinsea Octagon that allows easy adjustment for different sized eggs. Again, if you look at the photo, you can see these inside (they are white). The Suro can hold 24 hens eggs or 20 duck eggs, 12 goose eggs, or up to 60 quail eggs. There is a small air vet on the lid that can be opened up to allow the eggs (or chicks) to breathe. The buttons on the lid are push buttons recessed behind plastic which are easy to ‘wipe clean’ with a damp cloth. Excellent visibility through the lid for monitoring of eggs. Easy to check and top up water level, without taking the lid off. Very easy to clean – it took me 15 minutes to clean and disinfect. Excellent price for advanced features like automatic humidity control. On the negative side, I found the pumping system a little tricky to set up but once I had figured it out and siphoned a little water through the tube, it worked without problems. The microprocessor control cleverly feeds the incubator with drips of water until the humidity increases to the set level and then maintains it perfectly. I tested the Suro with a dozen chickens eggs. 10 out of 12 were after candling at 7 days and after the 21 day incubation period, I was very pleased with the hatch of 8 out of 10 eggs. An 80% success rate I felt was good by anybody’s standards. Since running my tests, I have also read a number of positive comments on our forum from others who are also getting good results from this incubator. 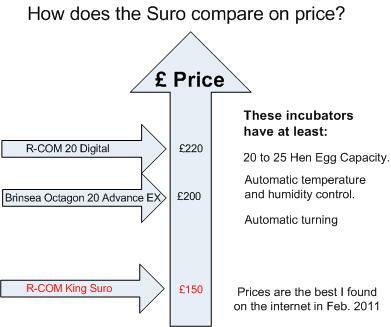 I have, over the years bought a number of different incubators from still air incubators to the more recent fully automatic computer controlled forced air units and of course they all come with a different price tag however I have to say though, I was surprised at the King Suro’s price tag of £150 – £170 (the price range I found in Feb 2011) since it has a fully automatic temperature, turning and humidity control which is often only found on the more expensive models of incubator. Overall, I was very impressed with the RCOM King Suro. Another competing incubator in this class is the Brinsea Octagon 20 Advance EX with very similar features. I prefer the pumping system on the Octagon but RCOM have certainly got the upper hand on price with the King Suro retailing at around £150 – £170 compared to the Octagon Advance EX at around £200 – £240 (the price variation is what I found between the different shops selling the units online). Overall, this is a fully featured budget incubator, I don’t think you can go wrong. The RCOM King Suro certainly gives features that are usually only found on more expensive models and I can sum this incubator up in 3 words: Value – For – Money. Overall, I was very impressed, this is definitely a great little incubator, suitable for most backyard chicken keepers with a small flock. For more information or to buy the RCOM King Suro 20 Incubator, follow the link below or click on the image to the right. Click here to buy the RCOM King Suro Incubator.